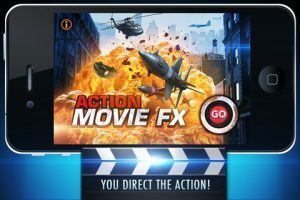 Many camera apps found in the App Store promise to deliver “Hollywood-style” visuals, but Action Movie FX by Bad Robot Interactive actually delivers on that promise. 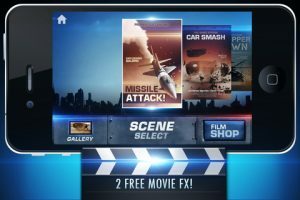 Giving users the ability to take everyday videos and add missile explosions, car wrecks, tornadoes, helicopter crashes and more, Action Movie FX can turn nearly any mundane video into a big-budget Michael Bay movie. (And chances are good that the plot will be better). Yet while Action Movie FX is a nice novelty for your iPhone, the options are fairly limited. And though it’s billed as a “free” app, only two scenarios are provided; each additional pair will cost you a dollar, and as of right now only two packs exist. However, for what it is, Action Movie FX is good fun for some, and could be a cheap way for more creative folks to create a low-budget home movie with big-budget effects. 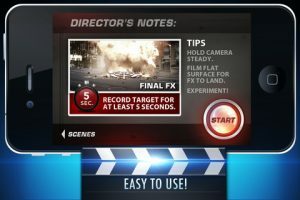 The interface for Action Movie FX is incredibly simple. Begin by selecting which scenario you’d like to use. As mentioned, the free app comes with “Missile Attack!” and “Car Smash”. Once selected, you then enter camera mode. Tips will appear on the screen, instructing you to film a flat surface, hold camera steady, etc. From there, it’s simply point and shoot. Each scene must last at least five seconds in order for the whole spectacle to play out. You can then choose exactly when the event will happen within your film. The layout for Action Movie FX is remarkably clean, but it’s also this simplicity that prevents users from fine-tuning the special effects. There are no adjustments to be made, so if you’re planning on shooting a long film with multiple missile attacks (for example), you must be satisfied with every missile explosion looking identical. In addition, much of the app is an advertisement for Mission Impossible: Ghost Protocol (In theaters now!). Not only are their multiple reminders of the film’s existence, but each scenario is “inspired” by the film. Ads come with the territory when we’re talking free apps, and fortunately these not-so-subtle reminders aren’t very intrusive. Bottom Line: Action Movie FX is a fun novelty tool that is sure to make those boring wedding videos worth revisiting. Action Movie FX is compatible with iPhone 3GS, iPhone 4, iPhone 4S, iPod touch (4th generation), iPad 2 Wi-Fi and iPad 2 Wi-Fi + 3G. Requires iOS 4.3 or later.